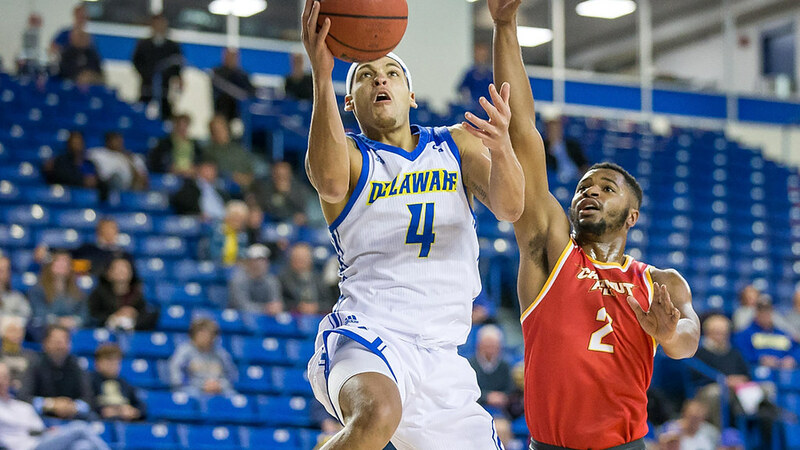 Kevin Anderson scored 10 of Delaware’s final 12 points in its first win of the season at Saint Peter’s. 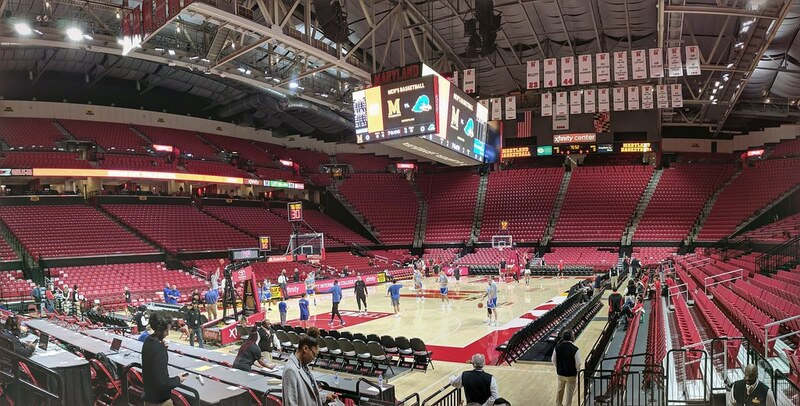 Delaware, who led by 10 points at halftime and by as many as 16, narrowly avoided a seismic second half collapse, defeating Saint Peter’s 78-75 in overtime Saturday evening in Jersey City. The Blue Hens went on a 13-0 run toward the end of the first half. Then, in the second half, Saint Peter’s applied full court pressure, and Delaware was coaxed into multiple lazy turnovers (Delaware committed 23 turnovers) that led to easy baskets for the Peacocks. Saint Peter’s shooters, led by guard Davauhnte Turner, also got hot from the field to help erase the deficit. Turner had two free throws with three seconds remaining to win the game for Saint Peter’s. He made only one, which sent the game to overtime. In extra time, Delaware guard Kevin Anderson took over. Anderson scored 10 of Delaware’s 12 points, three of which came from the line to put the game on ice. Delaware ran its offense primarily through Carter in the post. In the first half, Saint Peter’s sent help on almost every Carter touch. He got to the line often, knocking down 10 of 14 attempts. Carter once again passed well out of the post. His five assists tied a career-high. Carter got a little sloppy late, turning it over five times in the game. He committed his fifth foul with three seconds remaining in overtime to send a Peacock shooter to the line for two shots, trailing by three. Veretto was part of Delaware’s closeout lineup with Carter, Anderson, Darian Bryant and Ryan Johnson, playing most of the final 10 minutes of regulation and all of overtime. Veretto hit six of his 10 attempts and two of four from three. He made a couple of defensive plays inside and once made a nifty spin layup in transition. Veretto looked like a perfect complement to Carter’s inside game and Anderson’s playmaking ability, as a floor-spacing wing. Veretto saw a decent amount of minutes as Delaware’s three alongside Jacob Cushing and Carter. There are minutes to be had at that spot, especially with Ryan Allen sidelined until mid-December at the earliest. Goss once again started next to Carter, but Delaware only played a handful of minutes with the lineup at the beginning of each half. In the first half, Goss hit three of four attempts from beyond the arc in six minutes of play. In eight minutes of action in the second half, he did not attempt a shot. Goss, the transfer from George Washington, struggled inside defensively against the size of Samuel Idowu and Saint Peter’s forwards. Despite his size, at 6’11’’, Goss has shown to be more of a floor spacer than a rim protector in the early going. Anderson had an up-and-down game, facilitating offense in the first half, contributing to the turnover woes in the second half and then taking over and winning the game for Delaware in overtime. To open the extra period, Anderson used a pair of high Carter screens to take it inside and hit layups. Between to two drives to the cup, Anderson spotted up from deep and hit a three with a hand in his face. He hit seven of 14 attempts from the field and two of four attempts from three to get to his career-high mark of 25 points. Anderson also hit nine of 11 free throw attempts. His 31.76 usage percentage was the highest on the team. The high pick and roll was an effective way to limit turnovers and generate offense for Anderson late against man defense. It can also be a way to get the ball to Carter, if he is garnering extra attention in the post. Anderson needs to be able to dish off the high screen and roll or pop. Anderson gets dinged for his six turnovers, most of which came late. He played part in a defensive breakdown that allowed Turner to score 23. Anderson nearly lost the game for Delaware, when with 18 seconds, remaining he pushed the ball in transition and turned it over, instead of starting to dribble out the clock and likely getting fouled. Had he been fouled, Anderson would have had the opportunity to give Delaware a two possession lead. The turnover gave Saint Peter’s another possession. Bryant fouled Turner as he was driving to the rim. He hit only one of his two free throws, which tied the game. Cushing played sparingly and unlike in Delaware’s loss at Maryland, was not in the Blue Hens’ closeout lineup. He hit both of his looks from three. He’s now 5-6 from three this season. Bryant played most of the second half and all of overtime but didn’t bring much. He was beat a few times off the dribble defensively and scored only six points off 3-7 shooting. He did hit a nice fadeaway jump shot from the paint. Like Bryant, Johnson didn’t offer Delaware much, especially given his large swath of playing time. He missed his three attempts from the field, but didn’t show as a weak point defensively for Delaware. Perhaps a silver lining, Bryant and Johnson were only charged with two of Delaware’s 23 turnovers collectively. After roaring out of the gates with a poster dunk and a double-digit scoring performance in his first career game, Horton was rather quiet in game two. He played most of his 16 minutes in the first half and missed all five of his attempts from the floor. Horton was the first man off the bench for Ingelsby again. As Saint Peter’s turned up the defensive pressure, perhaps Ingelsby felt more comfortable with more experienced players like Bryant and Johnson, plus the hot hand of Veretto.Otherwise, it’s not clear why Horton saw less time. Brandon Holveck grades Delaware's performance in its home opener against Chestnut Hill College.